As we move up from the heart chakra to the throat chakra, we now enter the symbolic, as the upper chakras represent the world of the mind. 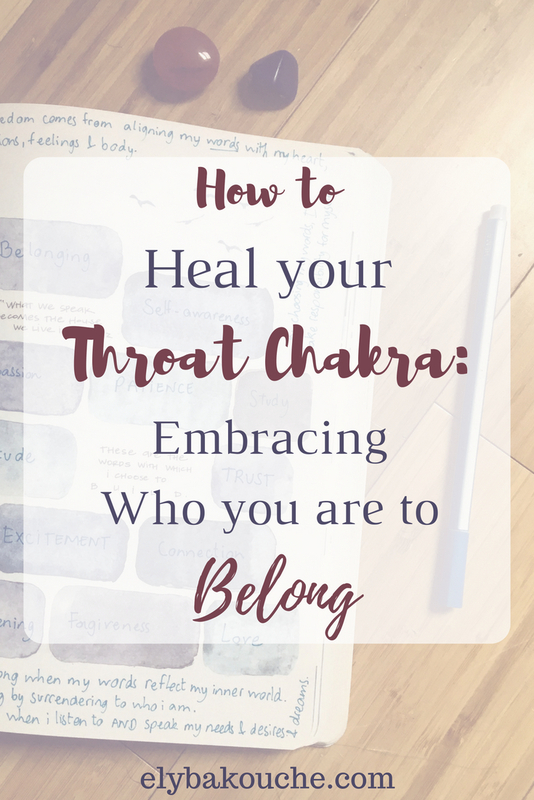 The throat chakra is the fifth chakra, the place where your ability to communicate, be creative, speak your truth - more on that in the next section - originate from. Through the throat chakra, you get to show the world who you are, through your words, and any kind of creation that is yours (songs, paintings and drawings, cooking, dance choreographies and yoga sequences, you name it). The words we use are linked to images we have in mind, symbols, and through words we take in and share worlds that couldn’t be accessible without speech and language (think about how you can talk about a person you don’t physically or personally know, or how you can discuss politics, an art movement or a yoga pose without actually doing any of those activities). To understand your throat chakra, you need to understand that through all the other chakras, you get to know yourself. You get to feel the ground beneath your feet (link), to connect to your emotions and sensations (link), to build confidence and willpower (link), and to connect to your heart center and sense of compassion (link). But if these lower chakras are off balance, if you don’t get the right signals or don’t pay attention to them, e.g. thinking you’re angry when you’re actually sad and grieving, or if you’re too shy to take action for what you want, you won’t be able to express yourself the way you’re meant to. When we say that something resonates with us, it means it speaks to us and we can associate what we have in mind to that thing. How can you resonate with the world and others if you can’t resonate with your own self? This will have an impact on everything in your life - how can you find the right friends, the right love relationship, if you’re unable to express yourself as who you are? How can you apply for the company that aligns with who you are if you don’t know what your core values are? That's how entire lives can get wasted: when we are not allowed or don't allow ourselves to speak who we are, we feel like we don't belong. This is all linked to your right to speak and be heard. I mentioned how the throat chakra allows you to ‘speak your truth’, but what does ‘speaking your truth’ actually mean? Recently, it’s been everywhere, and you probably saw Oprah Winfrey’s words all over the internet. Without getting to political here, your truth does not refer to ‘alternative facts’ but to your ability to share what’s on your heart, your opinion and thoughts, to express yourself freely without being interrupted, censored, or shut up. You have the right to speak and be heard, but more than just saying words out loud, you have the right to speak what’s inside your head, what matters to you and your personality. In that sense, the throat chakra and your ability to communicate is heavily linked to the lower chakras. Through the sacral chakra, you are in touch with your emotions; through the solar plexus, you have the power and confidence to physically express yourself; through the heart, you accept yourself as who you are; if any of these chakras is off balance, your throat chakra will suffer from that, too. To be able to speak and be heard the way you're meant to, it is crucial that you pay attention to yourself - to your physical well-being, your emotions and feelings, your confidence and self-esteem and your self-talk. As mentioned earlier, your throat chakra will suffer from your sacral and heart chakras being off balance in the sense that if you don’t know how you feel, what you feel, or what you love, it will be hard or impossible for you to express what matters to you, i.e. to express yourself properly. Although back then I had no idea about chakras and how they worked, there was a time when I felt very disconnected from the people around me. I couldn’t connect on a deeper level, and felt like I didn’t belong where I was. From my late teenage years up to my first three years at university, I would find myself in groups of friends where I couldn't take part in conversations because the topics didn't resonate with me or who I was. I constantly vacillated between feeling angry at everyone for not making space for me and the desire to change everything about my mind to be able to be part of that space. Sometimes, I'd end up in places like bars and clubs with desires to struck deep conversations about the world and God and the meaning of life and wondering what was wrong with me. I didn’t dare telling my friends I'd rather stay home on a Saturday night because I had plans to run the next morning and watch the documentaries and TV shows I didn’t have the time to watch during the week. I felt neglected and stuck, and like no one listened to me. Really alone. I didn’t want to see that the only thing that was wrong with me was my inability to share what truly mattered to me with the people I loved. There was definitely a bit of shyness in there - what if people judged me for being… me? - and anger that I couldn’t identify as such - why on Earth was it so complicated for them to understand me? Expressing yourself ‘properly’ doesn’t mean expressing yourself with the perfect words or the smartest ideas. It refers to your ability to share what you actually think and feel with the world around you. Taking my yoga teacher training helped me understand that. It gave me the confidence (and proof!) that all I had to focus on was on being authentic and aligning my words with what was in my mind. I gained the confidence - and deep understanding - that hiding away from my needs, desires and likes didn't serve anyone, and least of all, me. Since then, I've been learning how to speak up and share what is on my heart, I've learned to get in touch with my emotions and to share them. Following my passion for writing has brought me to visit coffee shops on Thursday afternoons (where you can’t be if you’re at work) and I've met free-lancers and entrepreneurs who make me feel like I do belong. Using social media to share what truly makes me feel who I am, what I care about, what scares me and what excites me is when I get to connect on a deeper level with people, and with you. If you feel inadequate, like you don’t belong, you might need to ask yourself if you’re saying what you truly want to say. If you feel you’re not supposed to be where you find yourself, taking small steps towards finding where there is gap between who you are & what you do is what you should be focusing on. The second practice below is my personal favorite. Here is a video to ease neck and shoulder tension; it's a video you can come back to often (or just remember the poses and do this from bed with your favorite playlist on). Neck and shoulder tension can be anxiety, fear and stress symptoms, all of which could be related to a throat chakra off balance. Get in the kitchen, get a pen and paper, markers, paint, a musical instrument and start experimenting. You need to find what allows you to express yourself. Get yourself a website if you need a platform to share what you have in you. Get yourself pots and plant seeds and flowers to create a garden that reflects what you have in you - your tastes, desires, and needs. The more you practice self-expression on your own, in your own bubble, the easier it will get to do the same with others.